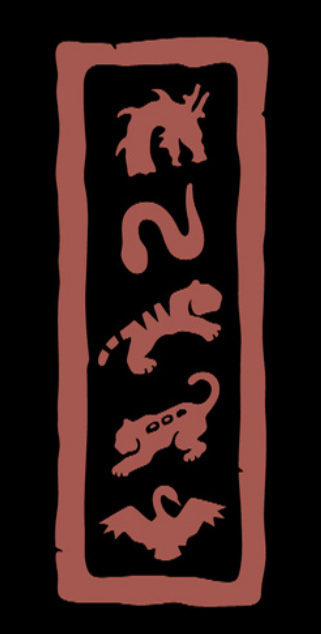 "Five Animal" refers to the teaching system of utilizing the dragon, snake, tiger, leopard, and crane as the visual metaphor for organizing fighting techniques and strategies. "Kenpo" is a term meaning, "fist law". Thus, Five Animal Kenpo can be defined as follows: "The study of self-defense, and its related ethics and moral code, utilizing the movements and strategies of the five animals -- dragon, snake, tiger, leopard, and crane. The art of Five Animal Kenpo is to become one with the attack, utilizing only the amount of effort needed to control the situation. Thus, we do not compete, we complete. We do not stop, we continue. We do not destroy, we allow creation to fulfill its natural cycle. The duality of mind and body become one. The duality of victim and opponent become one. The duality of victory and defeat become one. The "one" is natural action. The curriculum of has been carefully developed and refined to quickly bring students to a state of spontaneous skill guided by ethical restraint. A student learns basic fundamental skills, eighteen stationary sets, a stance drill, three empty hand forms, eighteen sparring techniques, seventy-two self-defense techniques, a conceptual overview of the five animal controlling order concept and various principles of movement to better understand the science of correct movement.